These pictures were taken on the 10th August 2009 and 11th of August. 2010. They show, better than anything I’ve seen yet, the veritable explosion of the River Indus. 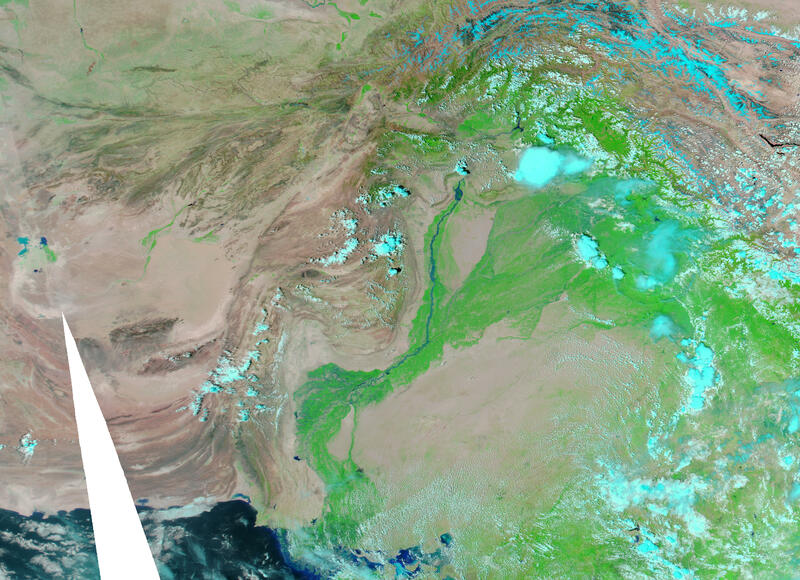 Don’t forget that these are satellite images and the scale is enormous: these pictures show essentially all of Pakistan. History of Sindhu RIVER and SINDHU Sanskruti is ancient. And it goes back to Vedic times. People living near those rivers are aware of those all History, facts and believes. SINDHI is pronounced as INDUS but actually is SAPTA SINDHU RIVER. And SAPTA SINDHU Avrohan (descend from Himalaya) is not just any of Mythology but perfect science fact. What is SAPTA SINDHU RIVER? 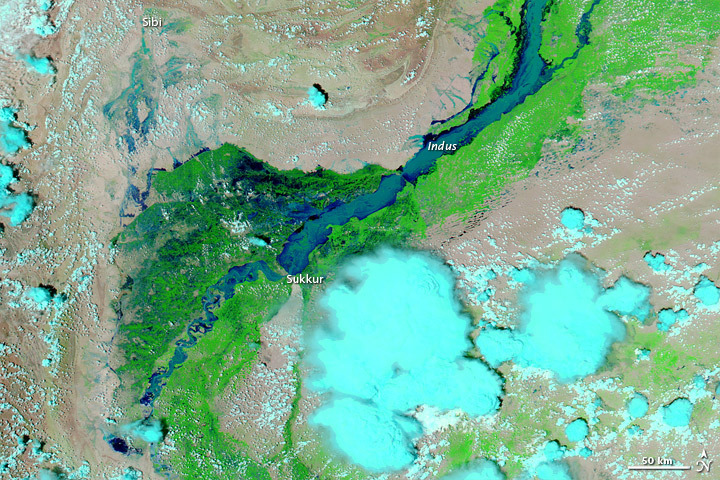 As we count those rivers as SINDHU (INDUS) originates from west KAILASH region. And drain to Kashmir valley to PANJAB it meets with other five rivers of Punjab named as RAVI, CHINAB, JELUM SATLAJ and BIYAS. But that’s the 1+5 =6 ONLY then why SEVAN RIVERS of SAPTA SINDHU? The seventh was SARASVATI which now dried river bed as a remnant as GAGGAR HAKARA river of Rajasthan. As land area of the river bed has been uplifted and diverted the water flows to other channels. So it was SAPTA SINDHU (seven rivers). Peoples staying on the river banks are aware of all the facts and reality and also with mythology. It has been said that the SAPTA SINDHU is a pious river and it has descended to clear all dirt and SINs to make the land pious and fertile and free of SINs and sinners. Scientific fact is that as river NILE , GANGA- YAMUNA and Brahmputra, SAPTA SINDHU – Indus is also givers a fertile lands, washes up all dirt and Sins to make land pious and fertile. Nature and weather all are scientific and are natural phenomenon of god to make the all river to fulfil all that are supposed to do with cleaning the dirt’s and sins from there and make them pious and fertile for those pious people. What the heck has ‘god’ to do with it? Ever heard of the water cycle? All predicted in a plaethora of papers as impacts of AGW. Let us leave ‘god’ back in the superstitious, ignorant past and, instead, concentrate on human responsibility in exacerbating natural cycles.